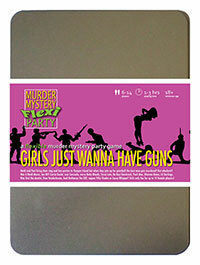 You've been invited to play the role of Carrie Doubt in Girls Just Wanna Have Guns. Heidi and Paul are throwing their pre-wedding parties at luxury spa and adventure resort, Pamper Island. But after one too many drinks, the bride and her entourage are invited to 'hunt the stag' with paintball guns - and best man Steve Wingman meets a grisly end! Can you find out who murdered him? Grab your guns and get ready for a facial at the luxury spa and adventure resort of Pamper Island! As maid of honour, you wear a perfect paintball attire of t-shirt, tight jeans and boots. Your organiser is stuffed full of plans for the hen party. You’re smart, beautiful, successful and generally the best at anything you do. Your military-grade organisational skills make you ruthlessly efficient in all areas of your life, relationships included, and you’ve implemented a ‘first-date feedback system’ to help potential lovers make self-improvements based on your helpful evaluations. I’m Carrie, the maid of honour and BFF to the bride, and if it wasn’t for me we wouldn’t all be enjoying this high-class luxurious hen party on this beautiful island - you’re welcome. I’m horrified, naturally, by this terrible murder but I don’t see why it should ruin everything I’ve planned. You all still have your itenararies, I hope? Good. Then let’s aim to get this wrapped up by 10. I’ve arranged for us to lick tequila off the barman’s abs at ten oh six and I’d hate to be late.